Hi! It's Jilly. At the kids' Harry Potter birthday party a couple weeks ago I wanted to sort all the kids into their Houses, but I didn't have a Sorting Hat. So, I looked at a few tutorials online and MADE one! I liked the tutorial from Practically Functional. In her tutorial she started with a witch hat form from the craft store, but since it's not close to Halloween they were fresh out of them. So, I had to get creative! My kids had this foam cowboy hat from a friend's birthday party and I thought it would make a great base. Then I crinkled some scrap paper and set it on top to use as a filler. I cut up the sides of a brown paper lunch bag to create the top part of the hat. I glued the brown paper bag filled with scrap paper to the rim of the foam cowboy hat. Next, I started paper mache-ing strips of torn up brown paper bags to the hat, starting from the bottom and wrapping it around, layering the strips over each other, until I got to the top. Then, I added paper mache to the brim of the hat. 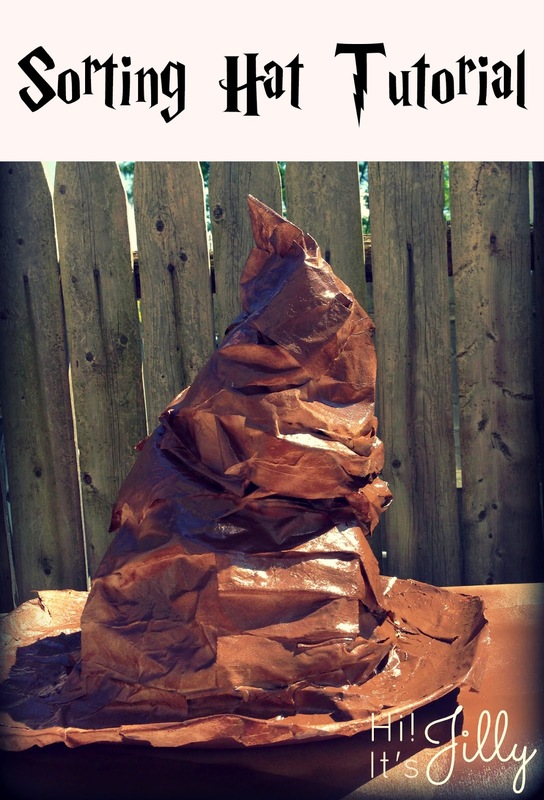 I let the paper mache dry, then took the hat outside and spray painted it brown. It took a day or so to dry. I LOVE how it turned out! I think it looks SO awesome! I'm going to keep it around for decorations at Halloween.